• The 24-year-old righty is an instance when the sum is better than the individual parts. • His fastball was between 89-93 mph and straight as can be. It has a bit of rise on it, especially for a fastball so slow. It only got a 31% GB% on the season with a 12% popup rate. Also, it was his only pitch which allowed a home run this year. It is extremely hittable with a 4.9% SwStr%. • He threw an 81-83 mph slider with some 3-8 glove side run. It is a good pitch which generates a swing-and-miss 25% of the time it is thrown. He can throw it for strikes. • Additionally, he had a 73-77 mph 12-6 curve which he could also throw for strikes and has an above average swing-and-miss rate. • Finally, he saw him throw a few 84-86 mph change ups. When the pitch broke, it was in the 12-6 plain. Sometimes it did not break. • He sometimes gets breaking ball happy as in throwing Simmons four straight breakers in the 4th. While I didn’t notice it, Eickhoff has been working a sinker which got almost no swings-and-misses, but did have a 77% GB%. • He worked quite a few hitters backwards because of his below average fastball. Keeping the hitters guessing is a huge advantage for him. Final thoughts: Eickhoff needs to improve his fastball in some fashion, or he will be a junk ball pitcher with a show-me fastball. If he can find some swing-and-miss with it, his stock will soar. He will be interesting with a flyball fastball and the rest of his pitches creating a high number of groundballs. • I watch Lopez after getting offered him in a trade in a deep league. I really didn’t expect much from him, but came back surprised. • He is a tall (6’4), skinny (165 lbs) with a high 3/4 easy release. If he moved to the bullpen, I could see his velocity play up. • His fastball started out at 95-97 mph and he could move it around the zone with ease. Instead of working side-to-side, he worked up-and-down …. well mainly down. The pitch had little horizontal movement. He threw 136 of them and was able to generate a 10% SwStr% which is way above average. • He did have issues keeping the velocity up. By the 4th inning he was in the 93-94 mph range. The drop can be seen in this graph by BrooksBaseball.net. • His second pitch was a curveball. It is a nice hammer at 83-84 mph with a 12-6 break. I think he lost his grip on the pitch a couple times and the ball almost hit the batter. • His final pitch was is a change. Its movement and speed cause issues with classification since it is around 89 mph and goes straight and down. It has the movement of many pitchers’ 2-seamer. • He lived off his fastball and had great results. His breaking balls aren’t consistent and sharp right now, so he could improve. Final thoughts: I see myself taking a chance on Lopez in several leagues next year. He may struggle the second and third time through the order without above average breaking balls or he could figure them out. • The 22-year-old righty is a pure thrower and it may limit his upside. • I will start with his slider because that is his favorite pitch. At times, he works backwards from it. It is 83-85 mph with a 3-9 break. He throws it 36% of the time. He threw it the 6th most amount all starters (min 70 IP) with his brother taking the top spot at 42%. The reason he keeps using it is its effectiveness. It has an insane 26% SwStr% to go with a 54% GB%. • His fastball was between 92-95 mph and straight with some sink, but little swing-and-miss (4%). I wished he would trust it more instead of always going back to the slider. • He threw a horrible 86-88 mph straight change. Final thoughts: I don’t like making the obvious comparison, but Joe Ross is Tyson Ross. Both throw a hard, but hittable fastball. To go with the fastball, they throw a devastating slider. 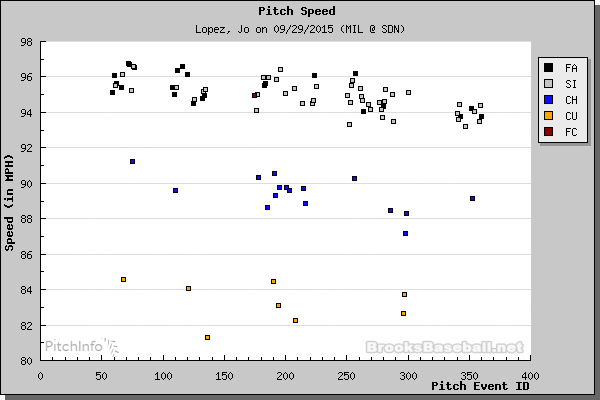 We hoped you liked reading Quick Looks: Eickhoff, Lopez, and Ross by Jeff Zimmerman!